The magnificent apartment overlooks the greenery of Huntington Park and some of the City’s well-known landmarks, including Grace Cathedral, the Pacific Union Club and the Fairmont Hotel. 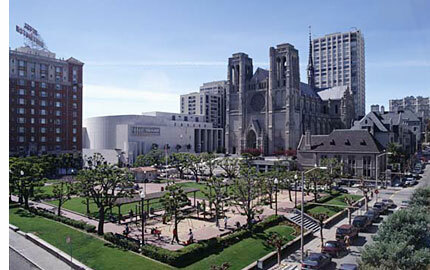 One can catch the cable car lines to Union Square and the Embarcadero to enjoy fine shopping, dining and entertainment. The two-level apartment has been thoughtfully executed and customized by renown interior designer Michael Anthony for elegant entertaining and comfortable City living. 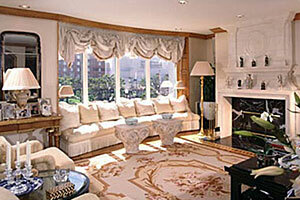 It features exquisite architectural detailing and the finest workman-ship, along with all the modern amenities. There is 24 hour doorman and security services and three assigned garage spaces. Enter the VESTIBULE from the keyed elevator through double doors to the ENTRANCE HALL. beautiful inlay parquet floors in the Versailles pattern. The walls are swathed in muted tones of silk. The sunny and gracious LIVING ROOM overlooks Huntington Park. A contemporary marble fireplace provides a welcoming setting. A built-in media center is housed on the opposite wall along with a wet bar. The beautifully proportioned DINING ROOM provides a rich and warm setting for elegant dining for eight to ten guests. 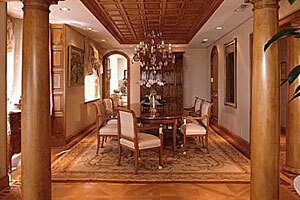 It features a vaulted wood carved ceiling with crystal chandelier. Informal dining may be enjoyed at the bar counter or the breakfast area. LAUNDRY ROOM with washer & dryer, additional storage. Service door & elevator. Exquisite staircase to the bedroom level. Elevator to this level too. Luxurious wall-to-wall carpet throughout. 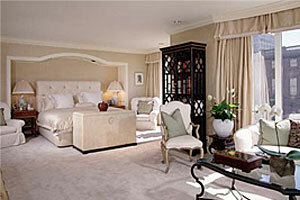 The spacious and tranquil MASTER SUITE overlooks Huntington Park and Grace Cathedral. It features a fireplace with gas starter, walk-through dressing room with ample his and her wardrobe storage, and luxurious MASTER BATH with marble surround, double vanity and shower. Second BEDROOM with window seat, adjoins the luxurious BATH with double vanity, spa tub and separate shower. The third BEDROOM and adjoining designer BATH completes this floor.